As a vegetarian, I’m always on the lookout for healthy and delicious recipes, especially ones that are quick and easy to prepare. One of my favorites is this fantastic Tomato-Mint Quinoa Salad. 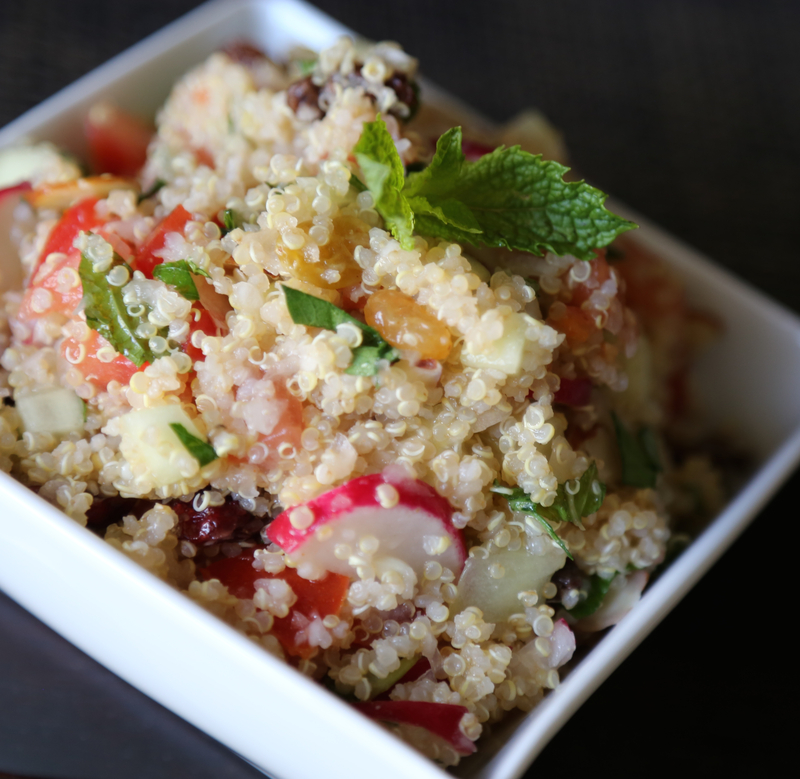 The blend of flavors and textures combined with quinoa* make a very interesting and refreshing side dish for summer. I hope you love it as much as I do! Bring water to boil in a small saucepan. Pour in quinoa and a pinch of salt. Cover, and let simmer for 12 to 15 minutes. When quinoa is thoroughly cooked, remove from heat, and allow to cool to room temperature. Toss together the tomatoes, onion, radish, cucumber, and almonds in a large bowl. Stir in the cooled quinoa. Season with mint, parsley, cumin, lime juice, sesame oil, and salt. Chill 1 to 2 hours before serving. Before cooking rinse quinoa in mesh strainer for about a minute to make sure all the saponins are removed. As I like my quinoa with a bit of texture, I usually use a little less water than this recipe suggests. For this recipe, it’s quite easy to prepare the salad to your own preference. The possible variations are numerous. For example, if you prefer, you can cook the raisins with the quinoa instead of adding them later with the other chopped vegetables. I also add dried cranberries for additional flavor. You will have to adjust seasonings (lime juice, sesame oil and salt) to suit your taste. When I want a little kick, I add a teaspoon of cayenne pepper. Bon appétit! *Quinoa (keenwa) is a nutrient dense grain from South America. It was a sacred staple of the ancient Incas. Quinoa appeals to health and natural food enthusiasts because of its ideal balance of essential amino acids and to food connoisseurs for its delicious flavor and unique texture. The flavor is appealing and not quite like anything else. Enjoy! Sounds amazing, ill have to try.. Quinoa is fantastic for vegetarians, love all that Veg Protein! Although I attempted to purée it for Rio when she was still on purées, and it didn’t turn out well, will just save it for when she has more teeth. I do like to mix a bit of cooked quinoa with sweet potato or yams for her. Love it this way, some say it sounds like thanksgiving stuffing…maybe that’s because I love thanksgiving stuffing! Your recipe sounds delicious! I like the addition of the hot sauce! Will have to try it too. Yes, quinoa is awesome for vegetarians. So nutritious, tasty and versatile! I’ve tried blended quinoa for baby but a friend just mentioned tonight that over cooking it with a lot of water/broth works just as well and doesn’t require any puréeing for baby food. Will try it tomorrow and see how it turns out. Gorgeous pictures of the quinoa. Amazing recipe! Merci! I’m glad you like the pictures as well as the recipe! Bon appétit!